You will call it sensational! Many doctors and medical researchers are now realizing the benefits of massage in the care of their patients. Some types of massage provide a general short-term feeling of relaxation, while others are designed to have longer-term therapeutic effects. The health benefits of massage include muscle relaxation, improved flexibility, reduced pain and better circulation. 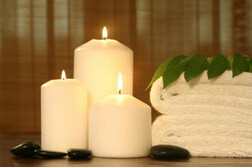 Additionally, massage diminishes stress, anxiety and depression. To get the most out of your massage, make sure you have a complete evaluation and explanation of the technique(s) that will be used. You should also make sure that the massage therapist has been properly trained in these technique(s). Our highly-skilled therapists perform full-body therapeutic massage to help you achieve total relaxation and stress reduction. At your request, we can focus on specific areas needing special attention. Massage sessions include 50 minutes of hands-on therapy, plus time for consultation and dressing. We use only the highest quality pure, hypo-allergenic products, and we are committed to your comfort and satisfaction. Call today to experience complete rejuvenation!